Super-strength and an amazing resilience to punishment, which they usually sustain in good measure. "We snigger stupidly in the face of adversity!" Too stupid to know when they're beat. 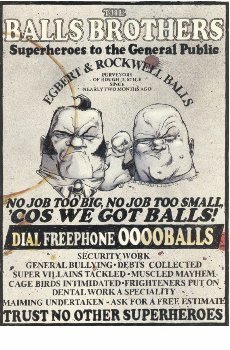 The Balls Brothers want to set themselves up as bona fide superheroes - and pay some bills. Biologically-enhanced products of the Institute for Irresponsible Genetic Engineering, the Balls Brothers have set out to make their mark on the world.